When you make the decision to cut animal products out of your diet, it’s quite easy to knock out around 95% of them just by avoiding meat, dairy products, and eggs. But the last 5% can get a bit tricky until you learn the ropes and the more obscure animal ingredients to look out food. There are several animal ingredients that can make their way into food items that you’d never suspect. Here are 8 of them that you definitely don’t want in your food! Casein is the protein in mammalian milk that has been linked to cancer and many other health issues. It’s commonly found in processed foods including candies, energy bars, and even (for some bizarre reason) “dairy-free” cheeses and other items. Whey is another derivative of milk. It’s essentially a byproduct of cheesemaking. Rennet is added to mammalian milk which causes it to curdle, and the leftover juice is known as whey. While this remaining liquid “whey” used to be discarded by cheesemakers, it’s now often dried and used as an additive in other products, like protein powders, energy bars, cookies, and beyond. Gelatin has to be one of the nastiest ingredients humans have ever created. It’s made from collagen derived from boiled animal body parts like skin, bones, and ligaments (meat industry cast-offs). It’s most obvious use is in gummy candies, jello, and marshmallows, but it can also occasionally be found in some other foods like yogurt and ice cream. Carmine is an insect-derived ingredient used to color red food and beverages as well as beauty products, paint, medicine, and beyond. It’s produced by grinding insects into a powder and then boiling, filtering and processing it. Gross. Carmine can also be listed as “cochineal extract” on ingredient labels since it comes from cochineal insects. Rennet is the name of the collection of enzymes that are used to turn milk into cheese. It sounds innocent enough—until you learn where it comes from. Rennet is extracted from the stomach lining of young nursing calves. These enzymes enable babies to digest mom’s milk. But when humans want to curdle milk to make cheese, rennet is taken from the calf’s stomach lining. Not surprisingly, the calves do not survive this process. This one may be familiar to you. It’s fat. Pig fat, to be precise. And for some bizarre reason, it often finds its way into beans. Both canned beans and fresh beans at your local burrito shop can be made with lard. There is nothing savory about this ingredient or how it is processed. In one processing method, the fat from a pig carcass is scraped out and boiled, and the floating lard can be skimmed off the top. In another, the fat torn out of a pig is heated in a pan or oven. It’s then often treated with bleaching and deodorizing chemicals and emulsifiers. Hungry yet? Lard can be used in many proucts—buttery baked goods and beyond. But I most often find it in beans, so always double check that your beans are “vegetarian” and lard-free! Lecithin is a fatty substance that can be either plant-based or animal-based, which can confuse things. When it’s plant based, it usually comes from soybeans, rapseed, or sunflower—and these sources are vegan. When it’s sourced from animals, it often comes from eggs, milk, or fish. Lecithin is used as a food additive as an emulsifier. 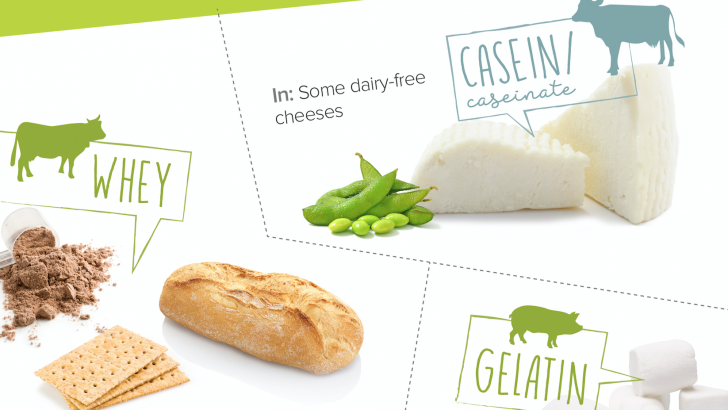 This one may seem obvious, but you’d be surprised to discover that milk can find it’s way into many “dairy-free” cheeses on the market. It’s no surprise that unsuspecting people often mistake these as vegan. So—always check the label or look for a vegan symbol! Pro Tip: You’ll notice that many products that don’t have any animal products on their ingredient list still say “may contain traces of milk” or “may contain dairy” on the package. This does NOT mean the product contains milk—just that it was made on shared equipment with other non-vegan products. Animal ingredients infographic from HealthLine’s Definitive Guide to Being Vegan.